Dodgers trade Matt Magill to Cincinnati Reds for outfielder Chris Heisey. The Dodgers traded right-handed pitcher Matt Magill to the Cincinnati Reds on Tuesday for outfielder Chris Heisey. Heisey, who turns 30 on December 14, joins a crowded outfield situation in Los Angeles after appearing in 119 games last season for Cincinnati, his fifth major-league season. The right-handed hitter owns a career slash line of .247/.299/.422 in 543 games, all with the Reds. Magill, 25, spent all of 2014 at Triple-A Albuquerque. The Simi Valley native had an 0-2 record and a 6.51 ERA in six starts for the Dodgers in 2013. The Dodgers face an 8:59 p.m. deadline to tender a contract to players with less than six years’ service time. Those who were not tendered a contract today by their 2014 teams are free agents. Trades such as these are common when teams have a need for a player who will not be tendered a contract by their current club. The pertinent question now is: Why do the Dodgers need another outfielder? Stay tuned. 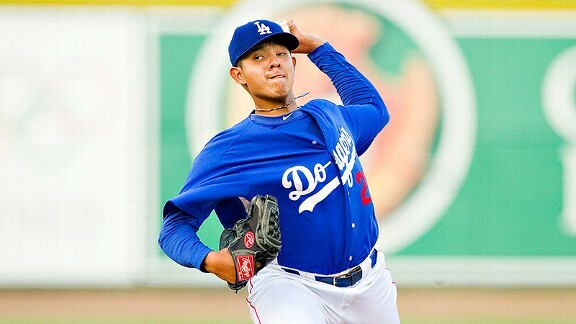 Dodgers’ De Jon Watson talks pitching prospects. Why isn’t Jose Dominguez in the major leagues? Why are Zach Lee‘s numbers so poor? Why is Matt Magill pitching in relief at Triple-A? These questions, and a few others, were addressed by Dodgers vice president of player development De Jon Watson in an interview with Examiner.com. Spring training ends poorly for Dodgers’ Dan Haren. ANAHEIM — Dan Haren‘s final spring tuneup was one to forget. The right-hander allowed all six Angels runs in a 6-2 Dodgers loss before an announced crowd of 43,553 at Angel Stadium on Saturday. The Dodgers resume regular-season play tomorrow in San Diego. It’s the Padres’ first game of the season. Opening Day for most major-league teams is Monday. Last weekend, the Dodgers beat the Arizona Diamondbacks twice in Sydney, Australia and have a regular-season record of 2-0. They came back and lost two of three to the Angels, officially finishing spring training with a 7-12-5 record. Haren didn’t go to Australia. Since the Dodgers only needed two starting pitchers (and kept Paul Maholm for insurance), Haren stayed behind and pitched minor-league spring training games in Arizona. The playing environment changed dramatically Saturday. Haren went from games with no official statistics and no names on the back of players’ jerseys to a sold-out stadium. The change seemed to have caught him by surprise. The Angels scored two runs in the first inning on back-to-back RBI doubles by Albert Pujols and David Freese. In the second inning, Mike Trout and Kole Calhoun hit back-to-back home runs. Trout’s home run came on a hanging split-fingered fastball, Haren said, while almost all of the Angels’ other hard hits came off his cut fastball. Haren allowed six hits in two innings. “It was just kind of getting it a little bit flat,” Haren said of his cutter. “I have to have the mindset of driving it down and away to a righty rather than just leaving it out there. Haren starts Wednesday in San Diego, the finale of the three-game series with the Padres. His final major-league spring training ERA: 6.00. 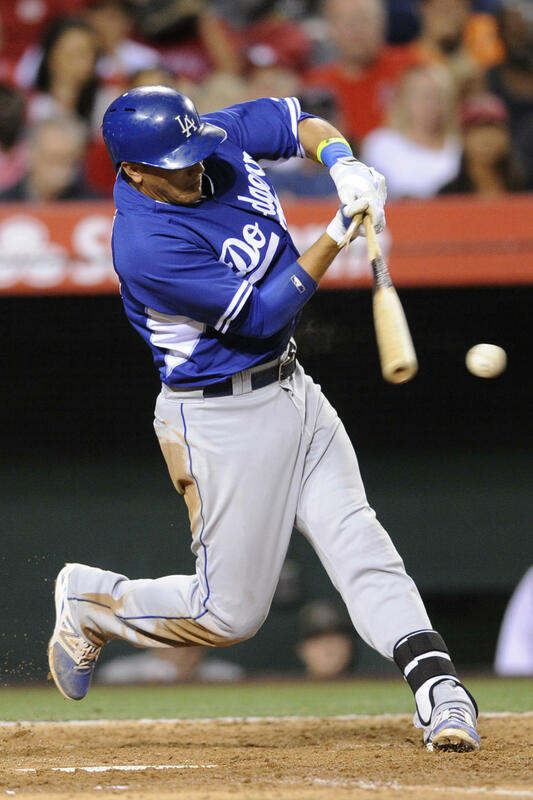 The Dodgers scored both of their runs in the third inning on a two-run double by Chone Figgins. Most of the starters played only two defensive innings. It was a good day for the Dodgers’ bullpen. Against almost entirely major-league competition, they combined for six scoreless innings: One by Brandon League, three by Matt Magill and two by Red Patterson. Dodgers tie Oakland, trim camp roster by five. The Dodgers trimmed their camp roster by five after tying the Oakland A’s on Monday. There were no surprises on the list: Pitcher Matt Magill was optioned to the minor-league side, and non-roster invitees J.C. Boscan, Carlos Frias, Brendan Harris and Clint Robinson were reassigned to the minor-league side. Magill, the only player of the group on the 40-man roster, pitched 5 &frac23; innings, allowing three hits, one run, walking two and striking out six. The only run came on a solo home run March 5 by Cincinnati Reds prospect Neftali Soto. Magill, a 24-year-old right-hander from Simi Valley, was not a candidate to make the major-league rotation. Of the four non-roster invitees, Harris had the most realistic chance of earning a major-league roster spot, if only because of the Dodgers’ needs on the bench and at second base. He needed a good camp to prove that he was not the same player who registered -2.3 WAR (baseball-reference.com version) since 2009. Harris didn’t have a good camp. He batted 3 for 19 (.158) with three walks. Boscan, a 34-year-old catcher with 30 major-league plate appearances to his credit, went 1 for 4 with a pair of walks. Frias made four Cactus League appearances and allowed five runs, including three Monday without recording an out in the Dodgers’ 8-8 tie. The 24-year-old right-hander advanced as high as Double-A last year and could earn a promotion to Triple-A at some point this season. The 29-year-old Robinson showed why the Dodgers signed him to a minor-league deal in the off-season, batting .348 (11 for 23) with a solo home run. Robinson batted .292 at Triple-A Omaha last year and is expected to start at first base this year for Triple-A Albuquerque. The Dodgers have 41 players on their camp roster, not including pitcher Scott Elbert (on the 60-day disabled list) and infielder Erisbel Arruebarruena, who is still awaiting his U.S. work visa. The roster must be down to 28 — 25 players who are eligible to play the two games in Sydney, Australia, plus another three designated as inactive — by 7 p.m. March 21.